The Eco-wifi router has a 10x reduced pulse frequency compared to an ordinary wifi router. 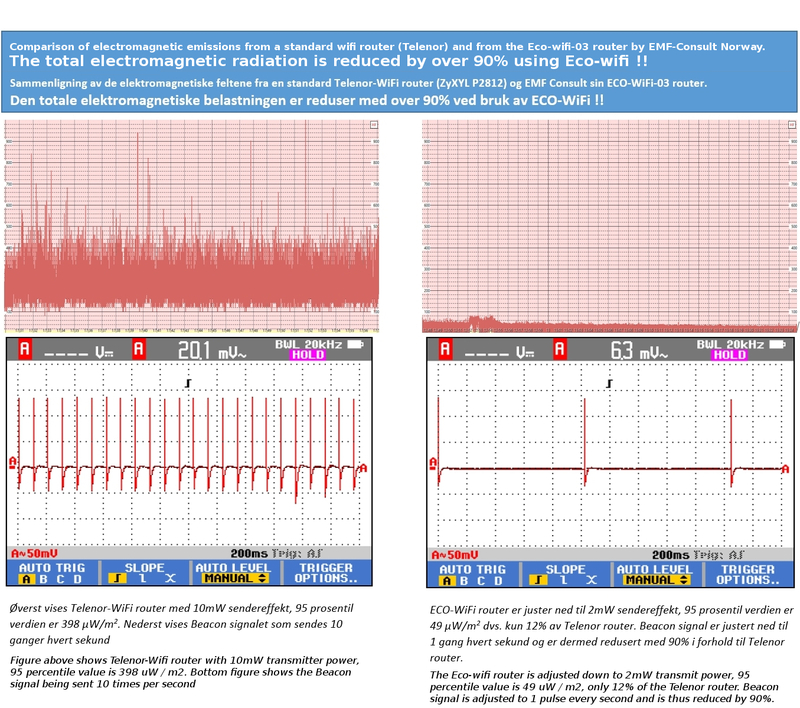 What is meant exactly by “90% less radiation in standby”? Packets containing the name of the wifi network – In ordinary wifi routers, the largest problem is that these are transmitted 10 times per second 24/7, both in standby and during usage. The Eco-wifi reduces this pulsation frequency to only once per second. Data packets -Type 2, the data, is only transmitted during usage, for example when loading a web page. Or when an app is requesting information from the internet, or your device is downloading updates. Remember measurement distance is crucial with the Acoustimeter as the measured power density decreases with the square root of distance. Connection throughput, range and network stability remain the same. The Eco-wifi offers “fine adjustment of range with 1 milliwatt step size: achieve up to 95% reduction in transmit power.” What does this mean? This is about the strength of the pulses. While the average pulse strength of the Eco-wifi in standby is 10 times reduced, because of the reduced pulse rate, the peak pulse strength in the default setting is similar as with ordinary routers. This is to ensure that the range is sufficient in the default setting. Unfortunately transmission power is technically inextricably linked to the range of the router, a physical fact that cannot changed. In many situations the range is more than enough and you can manually reduce the transmit power considerably. At the lowest power setting the exposure is reduced by a factor of 20 as measured in microwatt per m2.